Hope all of you had a great October! As we wrap up a month full of trainings, we’d like to send a big welcome to our newly trained COASSTers! Hope all of you are enjoying your first surveys. We’re glad to have you on the team. 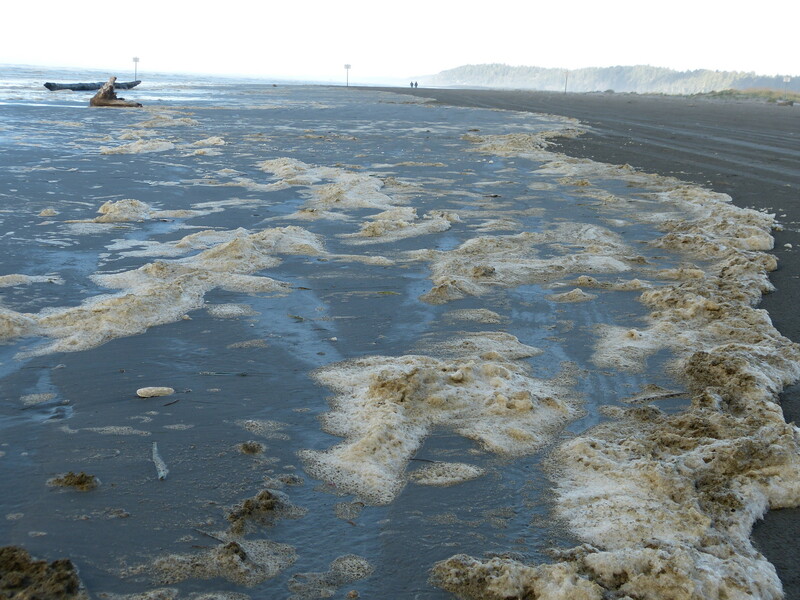 A few of you have asked questions about foam on your beaches this week. Last week­end, Carl (COASSTer since 2009) doc­u­mented a few stranded birds (two West­ern Grebes, one Brandt’s Cor­morant) cov­ered in algae at Griffith’s Pri­day State Park. 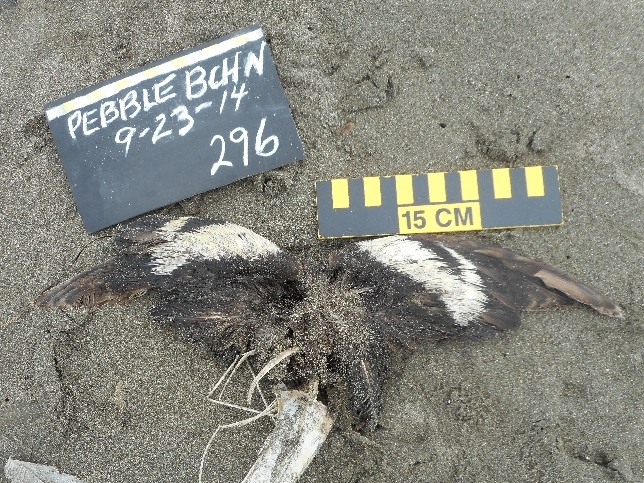 For COASSTers who wit­nessed the 2009 Akashiwo san­guinea algal bloom, this raised some con­cerns that the foam on the beach and the algae vis­i­ble on the birds might be Akashiwo. Check out the COASST blog for a photo of what Carl noticed. Thanks to the rapid response part­ners Raphael Kudela-UCSC, Vera Trainer-Northwest Fish­eries Sci­ence Cen­ter, Anthony Odell-ORHAB Part­ner­ship, water sam­ples col­lected this week­end will be ana­lyzed for the pres­ence of Akashiwo, with results avail­able as early as next week. We’ll relay the results to COASSTers and keep you posted. Thanks so much to all of you for all of your hard work this month! We really appreciate everything you do and look forward to seeing your datasheets and photos. The Oregon Coast was flooded with these this week – “small birds with blue feet” – here’s one found by Laura and Caren at Roads End in Oregon. Alaska foot key (page 34), West Coast foot key (page 22): webbed (go to Q2), completely webbed (go to Q3), 3 toes all webbed (go to Q4), tarsus <50mm, small foot – Alcids. 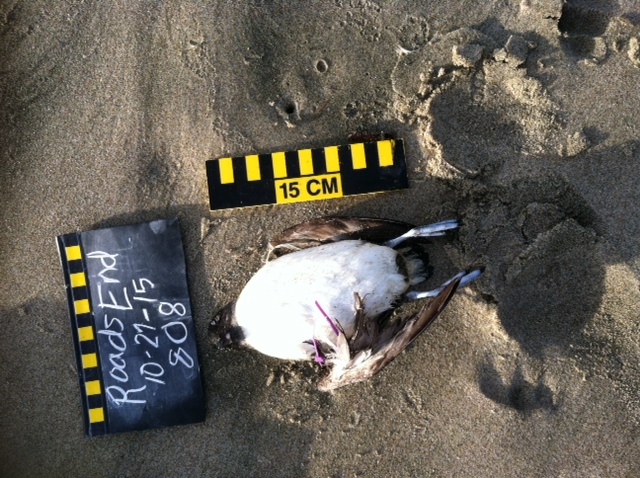 This bird was found by Don and Grace at South Spit in California on October 1st. Choose dark (go to Q2), dark (go to Q5), linings dark (go to Q9), primaries outercut, excluding outermost primary. Only one species fits – Greater White-fronted Goose – rare in Alaska. Choose dark (go to Q2), two or more thin white strips – Canada Goose or Greater White-fronted Goose. Canada Goose (WF19) has black feet – must be a Greater White-fronted. Choose mottled (go to Q14), choose mottling throughout (go to Q15), choose gray-to-dark underwing linings – Canada Goose or Greater White-fronted Goose. Canada Goose (WF19) has black feet – must be a Greater White-fronted. 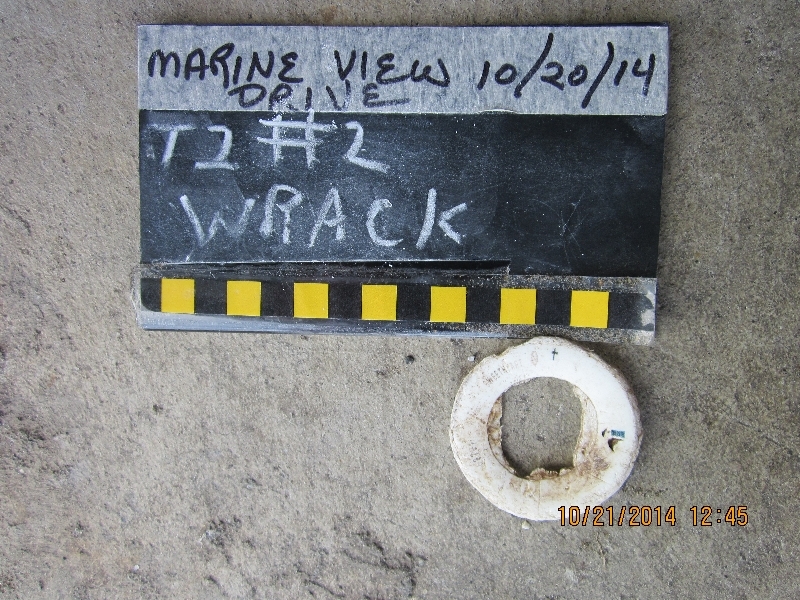 Marlene, one of our intrepid marine debris pilot testers, found this item. 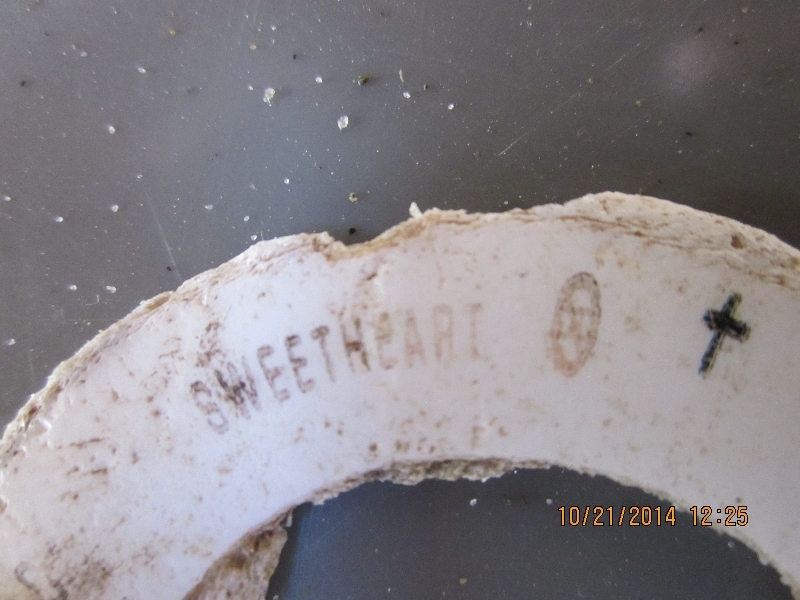 It is marked with “sweetheart” a cross, a couple of other unusual markings, and is just shy of 6cm in diameter. Anyone out there have a suggestion? 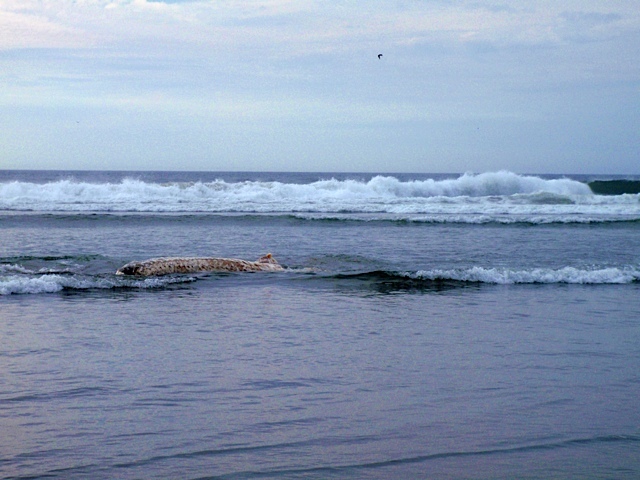 Take a look at this gray whale that Candace found at Otter Point on October 15th. 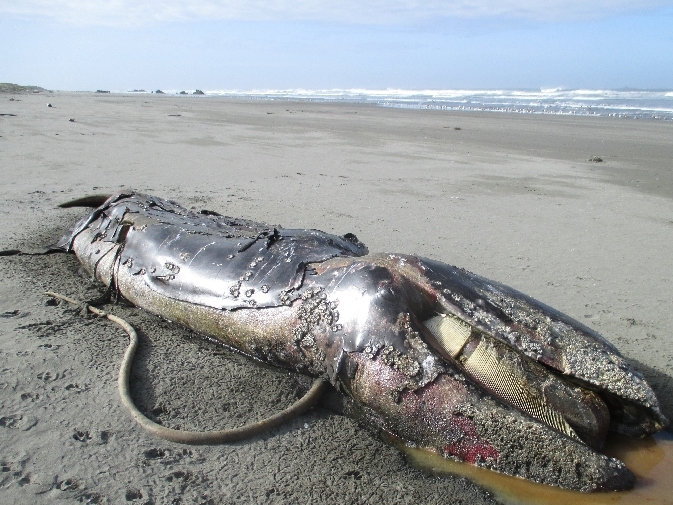 This whale is covered in barnacles and surrounded by footprints from all sorts of scavengers – birds, dogs, and maybe a few mustelids! 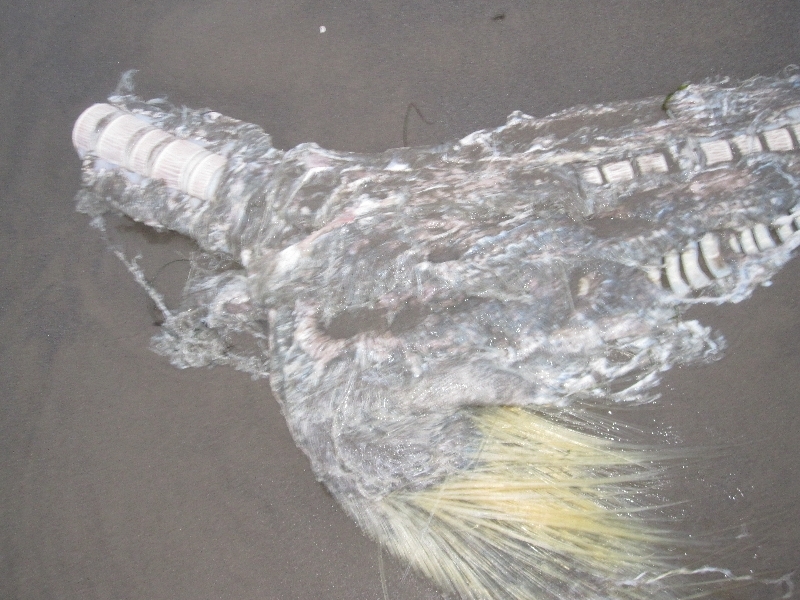 You can also see rows of white baleen plates, used by gray whales to filter amphipods and other organisms out from the gulps of mud they take in while feeding. 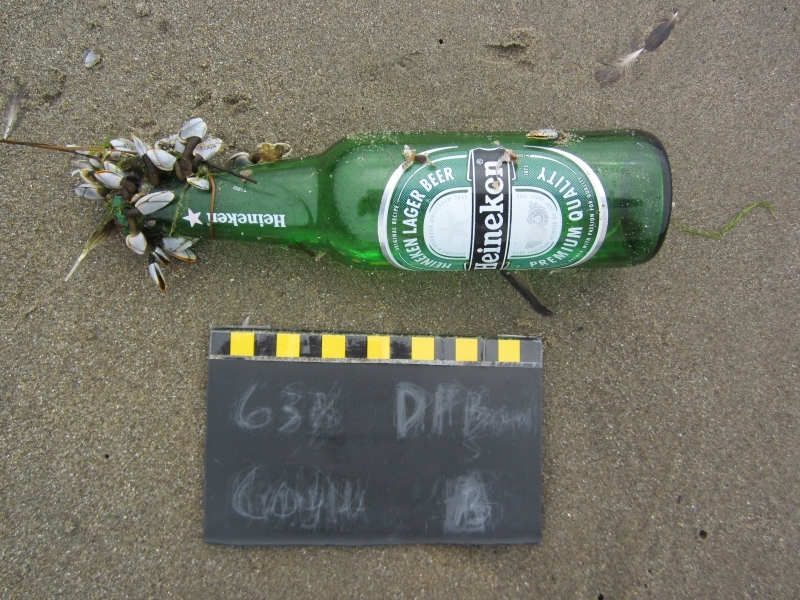 This entry was posted in Uncategorized and tagged beach foam, Cassin's Auklet, grey whale, sweetheart marine debris on October 31, 2014 by coasst. Hope that all of you are enjoying the beautiful fall weather! It’s been a great month at COASST, and we’re looking forward to seeing many of you over the next 2 weeks with trainings in Alaska, Washington, and Oregon. Have you had any rainy surveys lately? If so, now is a great time to check on your kit supplies. Let us know if you need more “rite in the rain” datasheets, additional cable ties, chalk, etc. We’re happy to help! We’ve had some great photos come in to the COASST office recently. Ken and Cathy found this bird on September 14 at Horsefall South in Oregon. Here we have a black bill with tube (some of us know where to go already), but let’s use the wing as a guide. Bill length is the clincher for telling these two species apart – Sooty Shearwater! Bill is diagnostic – must be a Sooty Shearwater. All the measurements fit for a Sooty Shearwater, but let’s look at the PALO profile. Oops – tarsus doesn’t fit and bill is not hooked – Sooty Shearwater it is! 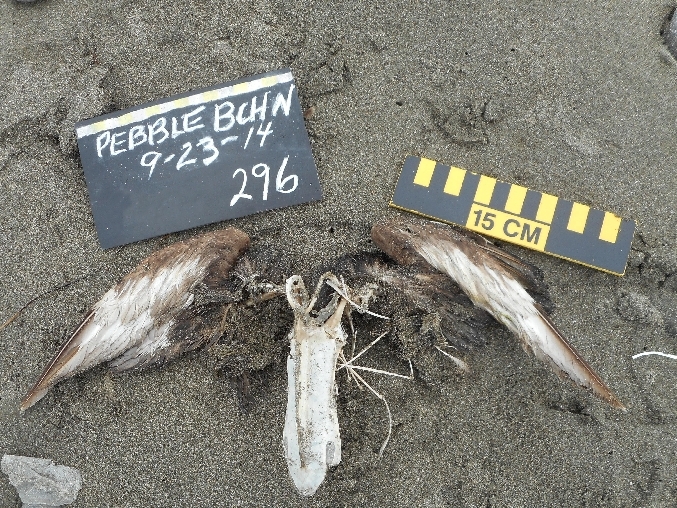 This bird was found at Cape Lisburne in Alaska on July 31 by Alaska Maritime National Wildlife Refuge Staff (just returning from an eventful field season). This species is only included in the Alaska wing key (page 44): choose “white-to-nearly-white” mantle. Yes! 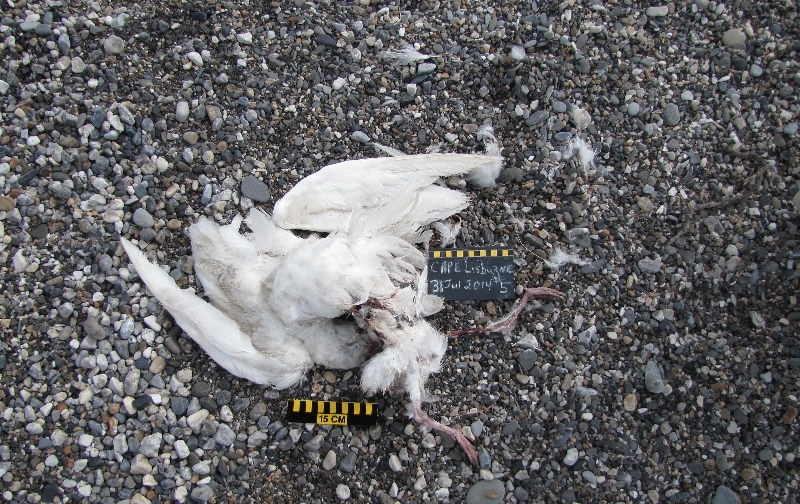 Only three choices: Ivory Gull (nope – wing chord too small), Glaucous Gull Immature (yep! ), Swans (nope – wing chord too big). GLGU – congrats! Cape Lisburne is the northernmost part of the Alaska Maritime National Wildlife Refuge. Check out this video of the remote islands monitored by refuge staff. 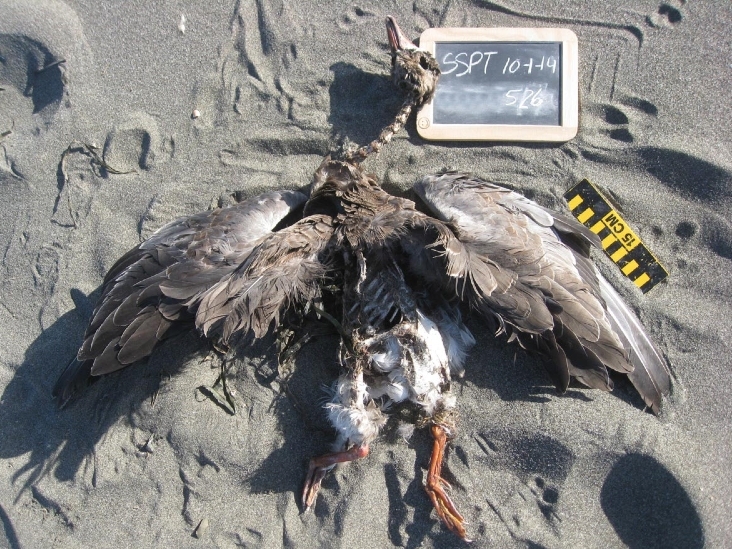 This bird was found by University of Washington Marine Biology students at South Ocean on October 12. West Coast: Common Murre (AL2), Pigeon Guillemot (AL10) – and we can eliminate a slough of other Alcids with dark bills since their tarsus measurement is way short. Alaska: Common Murre (AL3), Thick-billed Murre (AL5), Pigeon Guillemot (AL7), Black Guillemot (AL7). Same here – we can eliminate a bunch of the small Alcids with dark bills – tarsus measurement too short. 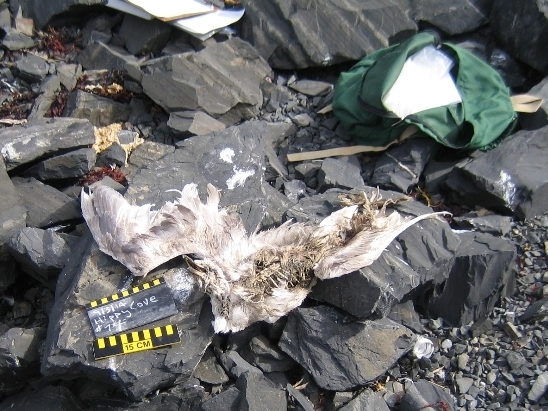 Upperwing (middle of photo) and foot (lower left) are all dark – Common Murre. Importantly, this bird is entangled (marked as “L” for line on the datasheet), a relatively rare occurrence (1/200 birds, or 0.5%). This marks the 35th entangled bird since the start of 2014 (or 1.4% of new birds in 2014), a number elevated by a single survey at Slip Point (WA) where Janet found 20 birds (mostly Sooty Shearwaters) washed up in a net. 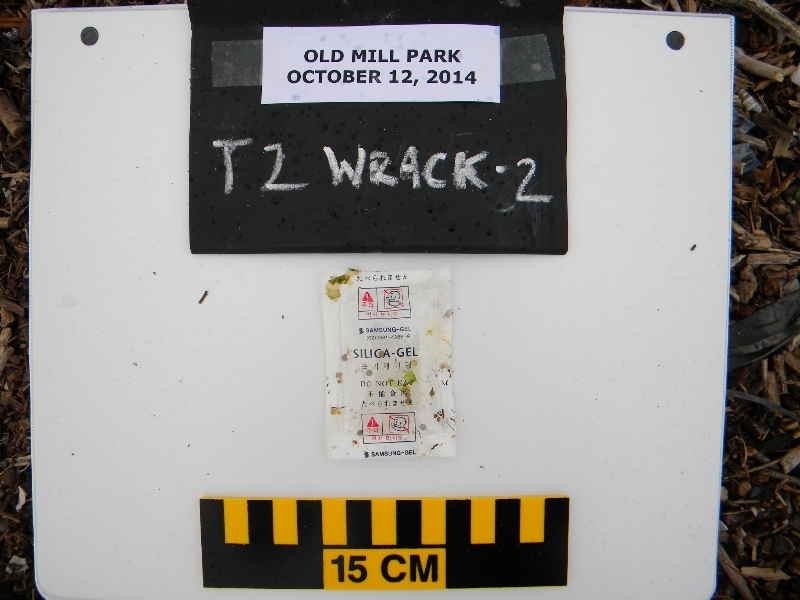 During his marine debris survey at Old Mill Park in Washington on October 12, Lee found this silica gel pack. It has a couple of great examples of symbols that can be recognized internationally as potentially hazardous to human health. COASST is keeping track of such information to better understand the amount and type of hazardous materials among debris objects. Gene and Keith found this abalone at Shipwreck Point South in California on September 25. Abalones move relatively short distances over their lives and attach themselves to rocks, waiting for kelp and other algae to drift by. 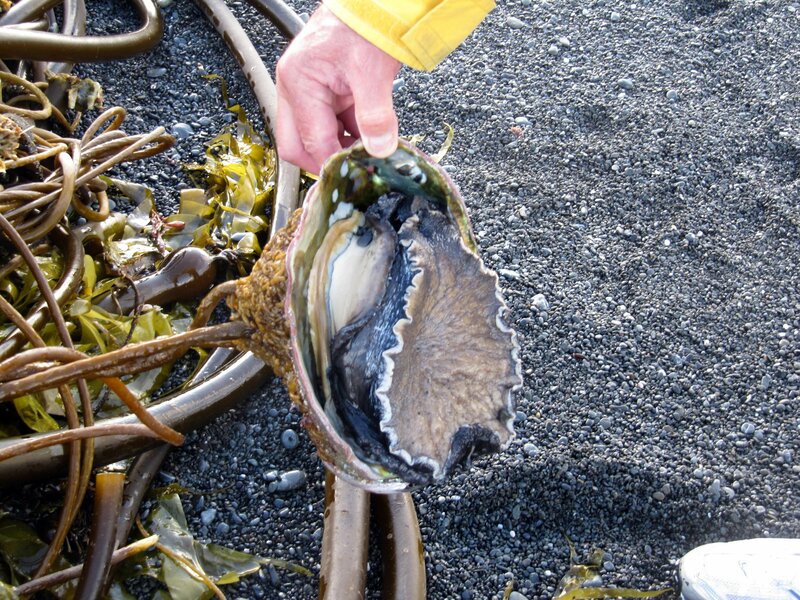 Using their large foot, abalone anchor themselves and also grab onto food. Once they have a piece of algae, they can then use their radula, a tongue like organ lined with small rows of teeth, to break it down into smaller pieces. 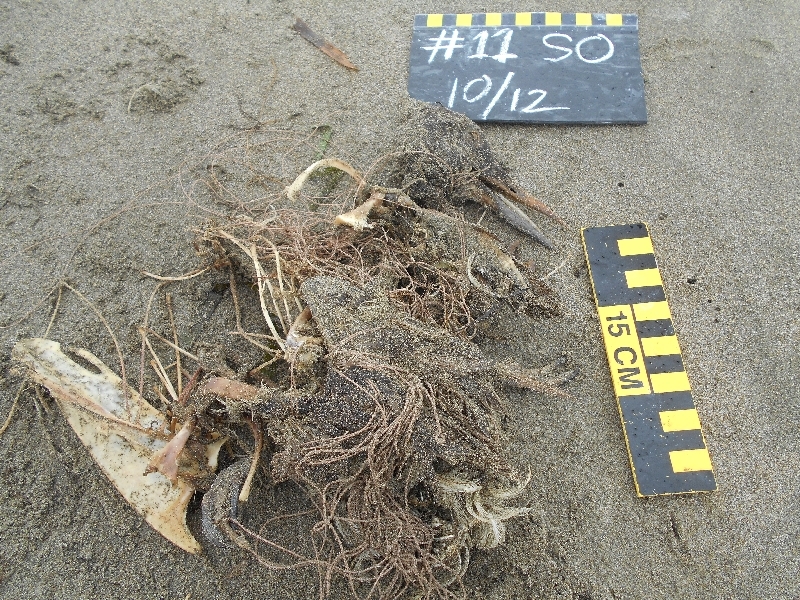 Here the holdfast of the bull kelp is attached to the shell of the abalone. It’s hard to say who is winning! 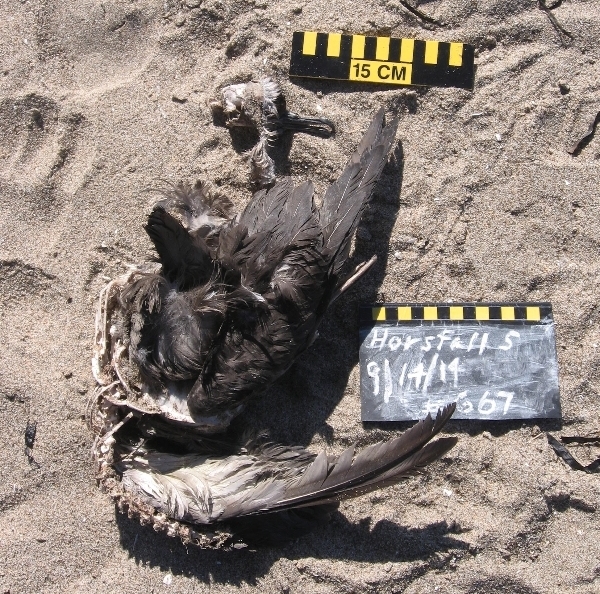 This entry was posted in Uncategorized and tagged Abalones, Cape Lisburne, entangled birds, GLGU, Sooty Shearwater, supplies, trainings on October 17, 2014 by coasst. 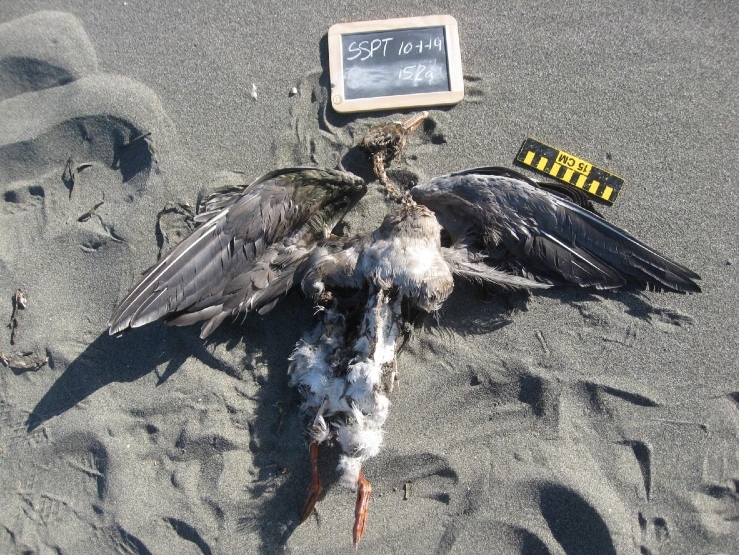 This entry was posted in Uncategorized and tagged avian pox information, biofouling, Marine Debris, Pigeon Guillemot on October 8, 2014 by coasst.